IP-based video surveillance is the next step in the evolution of video surveillance technology. By connecting to the existing Wired IP Network environment, the video surveillance system becomes part of the data network and can be integrated with other business systems to provide enhanced surveillance capabilities. Businesses today are increasingly concerned with the security of their premises. Security procedures and technology must effectively prevent vandalism, accidents, and unlawful building access from disrupting daily operations. For video surveillance, many companies still use closed circuit TV (CCTV), a legacy technology. However, CCTV is not an efficient way to view property and assets remotely, or to integrate new capabilities such as analytics and event-triggered e-mail alerts. IP-based cameras work with monitoring software and network-attached storage devices to allow improved event search and retrieval and remote management of the physical security solution. It provides a cost-effective way to implement an advanced security solution, and to upgrade from complex and outdated CCTV and tape solutions. It allows physical security systems to be integrated and managed using the same network that is used for the rest of the business. Deploying a video surveillance system poses some intrinsic challenges, particularly if using a CCTV solution, which requires specialized cabling. An IP-based video surveillance system provides greater flexibility when deploying the solution by using the existing data network. A case in point, power outlets might not be always available at the planned camera location. Installing additional power outlets can be very costly or might not be possible because of building codes or other constraints at the physical site. IP Video Surveillance Cameras with support for Power over Ethernet (PoE) technology, address these challenges easily and cost-effectively. 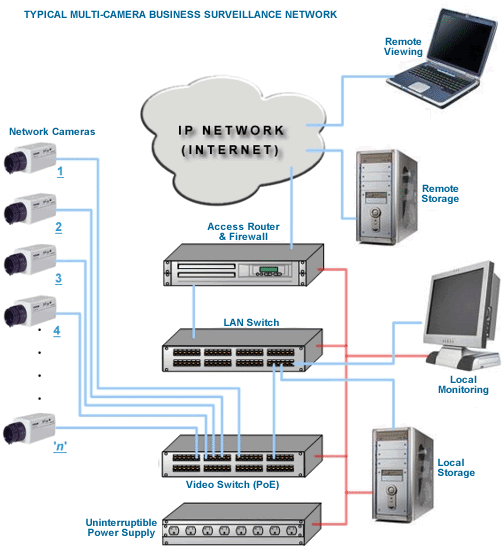 The Wired IT network PoE switches provide power to PoE-enabled cameras over standard network cable. Providing a data network cable at the camera location eliminates the cost of installing or extending existing power outlets.